The vibration of Color has an extraordinary and powerful effect on our mental, emotional and physical bodies. 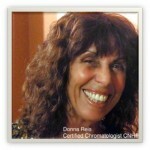 This seminar presents the principles of self -healing and self-empowerment through Color therapy. Students will learn the therapeutic value of Color and vibration. The workshop will show students how to prepare their own Color Vibration® Color Balancing System which will help them to identify, organize and understand their strengths and blockages. Color personality will be discussed along with growth periods and the physical, emotional, spiritual and psychological issues of each Color . This is an excellent workshop for practitioners we will spend the last portion of the workshop discussing how to incorporate this information your business! Balancing System will allow you to identify your blocks and enhance your gifts which will heal the emotional body and prevent dis-ease on the physical body. Don’t miss out on this opportunity to discover how ColorS can bring you into balance mentally, emotionally, physically and spiritually! For those who would like to study Color and it’s theraputic properties we have our workshop on DVD. 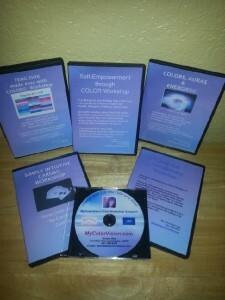 Self-Empowerment thorugh Color is a three DVD class with a CD (the CD has a printable book and Color Charts). Self-Empowerment through Color $80.00 plus shipping.